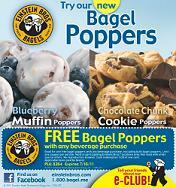 Print this coupon to get FREE Bagel Poppers with any beverage purchase at Einstein Bros Bagels. The coupon is valid through 7/16/2011. I didn’t have to print the Coupon and I just gave them the Code number on the Coupon and purchased a milk and got the Poppers free. Saving on ink is good too. Next post: Gerber Graduates Coupons + Other New Coupons to Start the Month!